In “A Cat’s Tale: A Journey of Spiritual Discovery” (published by Balboa Press) by William R. Angus, a tap dancing cat named Frankie visits a girl named Lynnie. Lynnie becomes the charismatic cat’s pupil, who teaches her how to live a life filled with love for herself and fellow travelers through time with his 10 rules of life. Readers may visit https://www.balboapress.com/Bookstore/BookDetail.aspx?BookId=SKU-001150953 to purchase and know more about the book. Frankie, who kept company with historical figures such as Cleopatra, Napoleon and Col. Chamberlain, draws from his past lives to teach Lynnie. Throughout the book, he unravels the mysteries of the universe. Peace and happiness, he teaches, are found from within. William R. Angus has had a varied career in both the private and public sectors. With over 30 years of experience, he has been an international business executive in strategic management, human resources management, labor relations and law. Angus has also been a newspaper columnist and entertainment photographer. He is currently a university professor and TV and radio political talk show host. He has published a number of articles, presented numerous seminars on workplace issues and employment law, and has been a keynote speaker at various conferences. Angus specializes in creativity training, body language and employee development and has demonstrated that creativity can be taught and developed. As a graduate of the Faculty of Law at Queen’s University and a member of numerous professional associations, including the Ontario Bar, Angus brings a wealth of professional experience to his seminars. 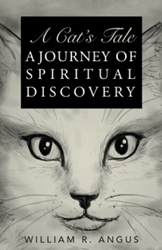 “A Cat’s Tale: A Journey of Spiritual Discovery” is his first book.